Main character's head is changed from lion to tiger. Ride of choice is changed from a horse to the motorcycle. Period piece to a modern age. 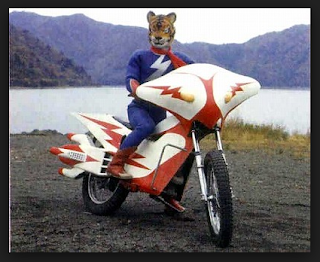 As the main character morphs into Tiger Seven, he abandons his motorcycle, which goes on to run over a small child. A villain from "lost continent" befriends a little girl and dies together as they hold hands. Tiger Seven puts on his "special glove," but finishes the villain with his kick. The show deserves a come-back. 1st, thanks as always for ur time and subs. 2nd, as im typing this i havent even seen this clip yet, only read the description. and i'm laughing just at reading the carefree examples. #3 reminds me of aho aho man. again. thanks to you and yours! You're one of the old faithful, and I appreciate your comments any time! That description, too funny. I was expecting that you had subbed something around that, but still that was fun. Good to see your still around subbing a few things, I hope your job is treating you well(Read your post about it on FB quite a while ago), and really nice to see you sub out a few things even if they are little. Can you please reupload the "Celebrities Who Cannot Draw" video? It was taken down. Hi, I'm really keen on finding some Tiger 7 sub files, but all my boolean skills have yielded naught. Would you have any tips? Certainly not one person will like it.